Microsoft Ignite is all about getting knowledge direct from the source—everything from industry leaders talking about what's next, to in-person Q&As with the people who built the tools you use every day. So what better way to introduce the 2016 conference than with insights directly from product experts—Julia White, Jeffrey Snover, and Mark Russinovich—sharing their thoughts about what to expect, what you can learn, who you'll meet, and why you'll definitely want to be part of it. Why attend? Product truths—and a commanding view of what's next. Microsoft Ignite is the single place where you can hear about all of Microsoft's technologies and, as Julia says, "we bring it." When we say "in-person access" we really mean it. At Microsoft Ignite, you can meet the people behind the products you use every day. And with 1,000+ hours of content, you can mix and match what you learn, how you learn, and even the best time of day to do it. Meet great people, and grow your community. Microsoft Ignite is smart people talking tech, everywhere you look. It's a lot of learning, and a lot of fun. Here's a glimpse of the many ways you can meet up with Microsoft experts and your peers. Tell your boss: This is why we need to be there. 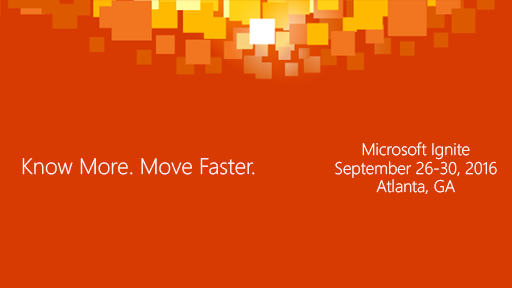 From high-level strategy to deep product insights, Microsoft Ignite will cover what's next in tech. It's great for your company—and your career.